Click to viewWelcome back to MangoBot, a biweekly column about Asian futurism by TokyoMango blogger Lisa Katayama. I'm a total sports nut. Olympic season makes my bones shiver with excitement. But this year, I took my mind off record-breaking swim relays and super-twisty gymnastics routines for a minute to consider the host country's techno-socio-political future. The opening ceremony confirmed my theory that China is breeding robots. (We already know that the cute girl who performed the patriotic song was lip-syncing and that the fireworks shown on TV were fake. I'm pretty sure that the 2008 drummers who kicked off the five-hour technological spectacularity were androids, too.) But what else is up in the giant nation that many believe will be the next world superpower? I called some experts and came away with a list of five predictions for China's next half-century. , believes otherwise. "China has authoritarian resilience," he says. "If (the current regime) was not supposed to survive modernization, it's proving very adaptable." In other words, as long as Hu Jintao's government can prove itself efficient albeit its shortcomings, the people will continue to sustain their loyalty to it. Nathan does pinpoint one costly solution to bringing democracy and human rights to China. The current regime could be toppled, he says, if China were to be hit with a series of natural disasters, terrorist attacks, and bad political decisions (like if they invaded Iraq and accrued a huge budget deficit... hint hint). If the current regime relies on a certain complacency cushioned by the fact that, while it's oppressive and fucked up, it somehow seems to be working, a mechanical failure of the government machine could unleash the unrest and cause a revolution. Simply put: The dystopic Communist regime that punishes free will and uses forced labor to build the economy may continue to rule China until a superhuman disaster wipes it out of existence. 2. A giant amount of wind power will up the nation's hip-and-cool factor. Green tech is the new black-it's the symbol of belonging in the hip and cool country clique. China plans to be the hippest and the coolest by 2020 by becoming the world leader in wind energy. According to EcoWorldly.com, the country currently produces about 6GW of wind energy, which makes it fifth in the world. Some experts believe that China will reach at least 100GW in the next 12 years. That's an increase of 1667%! China still relies a lot on old school energy resources like coal for its imitation Prada handbag factories, but a 2005 legislation mandates all utilities to be supplied by renewable energy. Clean tech funds are being bought up like lychees at street stands. 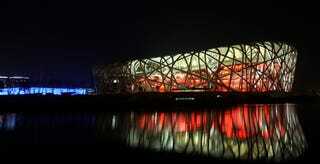 , believes that Beijing will be the hub of the next Silicon Valley. China also has the fastest growing number of patents-it's currently seventh in the world-and owns the world's largest Internet market. "Venture capitalists are all looking for the next new thing in China," she says. "Chinese entrepreneurs are hard working and passionate, and they're bringing knowledge from the US back home." China isn't just the hub of cheap imitation handbags anymore. It is, finally, rapidly and most certainly, inching up the manufacturing food chain and will lead the next major innovation cycle in web-based tech.